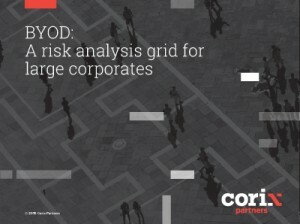 BYOD is not just an IT matter: Large corporates must address this under a broader management perspective and make the right decision in consultation with all parties. This is not for everyone or every organisation and firms should only get into it where it fits their corporate culture, on the right scale, with the right staff and the right training. Risks must be analysed with care taking all corporate aspects into account, not just the convenience elements. In many cases, there will be legal, managerial and cultural aspects to consider.